There’s even more space for socializing in the back room. Burnin’ Rubber • by Mike Blanchard | Every time we have gone to Wendover to hit Speed Week we have hung out in the nasty casinos or made do with a pile of beer at the KOA camp. This year while we were hanging out at the late night car show that goes down during the opening weekend Dean mentioned a cryptic message about a good bar. Someone, he won’t say who, had tipped him to a place called the Black & White. Off in the dark end of town, in a trailer park, “too far to walk” Dean was told. Well hell! We decided we were not going to let some old man tell us we could not walk to a bar. We wandered off down the hill into the dark (a ridiculously short distance from the car show as it turned out) and found a magical place, Carmen’s Black & White. 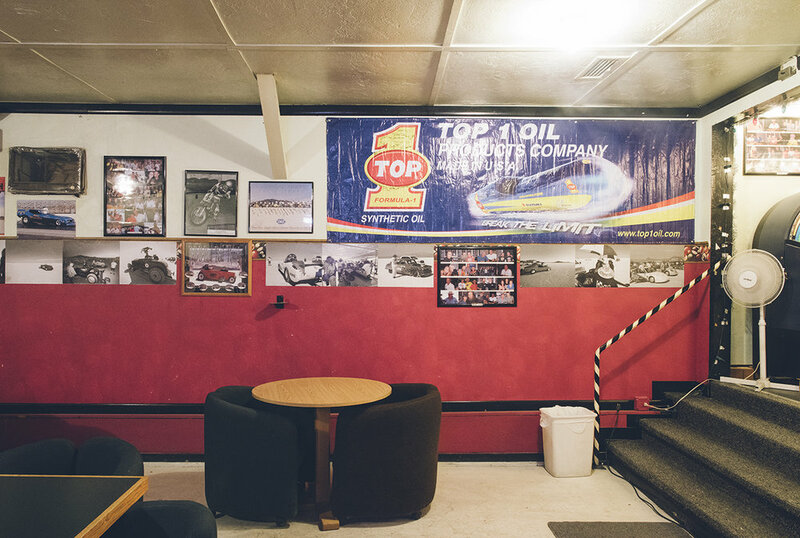 We came in from the dark into one of the great shrines to land speed racing. A rather large place, the walls inside are covered with photos and mementos of the cars, motorcycles and teams that race on the great saline table. There are framed posters of speed week through the years, many signed. There are photos of Don Vesco, Poteet and Main, Al Teague, Danny Thompson and many others warmly inscribed to Carmen. For us it was like walking into Pancho Barnes’ place and hanging out with the test pilots from Edwards. A really cool bar. Just the kind of place you want to hang out. You know, a good bar. Not too fru-fru, not fake, not corporate. 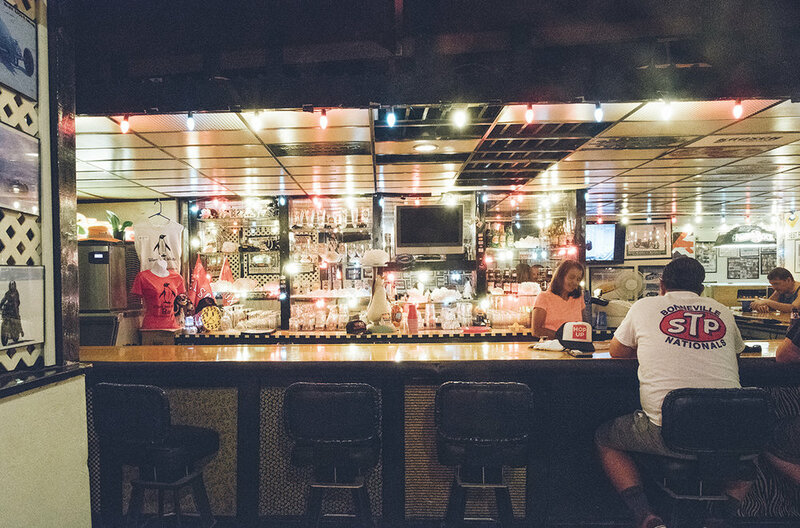 A place with a nice quiet corner, a well-appointed liquor shelf and beer selection. A good bartender is key. You know. The Black & White is one of those joints. Hell, the John Wayne movie “The Searchers” is playing on the big screen as we walk in. Yup this’ll do. Needless to say we all strolled off happy as larks later that evening. The next evening we met Carmen herself as she held court behind the bar. She bought the bar and the trailer park around it as a retirement plan. She is a straight-forward, get-it-done kind of woman. Trim and tanned with auburn hair and a friendly air she is happy to tell you what has been going on in town. Carmen can also discourse knowledgeably about what is going on out on the salt. She was interested in the Poteet vs Thompson shoot out that morning for top time of the meet. Both had gone well over 400 miles an hour on Saturday. But on Sunday morning Thompson failed to back up his run of the previous day, popping the chutes and backing out of it early in the run. It’s always five o’clock at Carmen’s Black & White. As the day wears on a few locals drift in from the shops around the old airbase and out of the neighborhood stretched out in the desert behind the shining strip of big box casinos. It takes a lot of work to keep your business going. There are a lot of vagaries that can go against you. The place used to be the Black & White Bar and Grill but it seems that the city has decided that the grill part must shut down despite passing all health and safety inspections. It doesn’t help that the casinos have a huge amount of pull on the city council in Wendover. Makes it hard for a business that competes against their hegemony. Not accusing anybody of anything. I’m just sayin it aint easy for a small business. But as we sat in the Black & White reflecting on the day, all that was out in the dark. A world that for all we knew, might not even exist, erased with a cold beer and good friends. If you get out to Wendover, even if you are passing through, even if it’s not Speed Week, do yourself a favor and hit Carmen’s Black & White for an hour or two. You will not regret it.